There comes a time in every knitter's life when they must face some hard truths about their knitting project. Or projects...plural...because sometimes you can go through a phase where you cast on and knit all the things and then nothing seems to work out! For instance, maybe the marriage of yarn and pattern just isn't the dynamic duo that you thought they would be yet you convince yourself to keep knitting on, completely ignoring that nudging feeling at the back of your mind. Or maybe you chose the wrong size or your gauge is suddenly way off (stupid swatch lied!! ), but you keep hoping, with every stitch, that maybe blocking will sort it all out and the knitted item will miraculously just end up perfect. Whatever the issue may be, sometimes you just got to face the music and say, "yeah...this isn't working". For some, that's a tough cookie to swallow, especially if a lot of time or money was already put into the project. For others, it's either a learning experience and/or all about the joy of knitting. Or, if you're like me, it's all the above. Due to my carpal tunnel, I feel like my knitting time is precious and must be used wisely but I thoroughly enjoy the simple act of knitting. And if the yarn is a complete joy to work with, well then it makes frogging and re-knitting not so bad. So what am I getting at here? Well, my friends, I'm going to be frank, two weeks ago I had to face some truths about my What The Fade?! shawl and those truths have led me to do something drastic. I'm frogging the whole thing. I know, I know...the past two posts I went on about how much I was enjoying the knitting and how much I was liking my colours and how they were fading. I was excited about what the last two clues were going to be and what direction the shawl design was going to go. Ok, before I go any further, I really contemplated about whether or not if I should blog about this because I don't want to offend anyone or come off as disrespectful, and I definitely don't want to create a stir or turn people off, but I wanted to be upfront and honest and didn't want to be that blogger that claims to looove everything. In public. 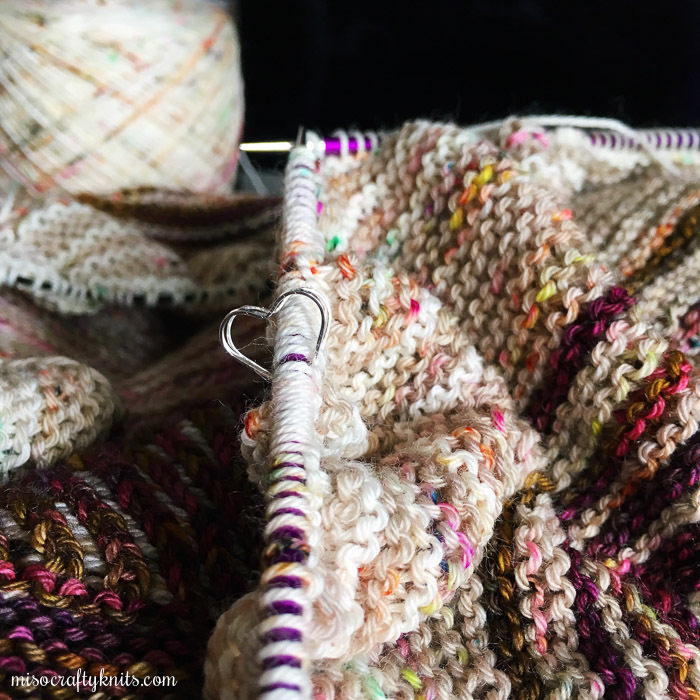 I decided to just go ahead and blog about this as I've already mentioned that I was participating in this MKAL and about my shawl several times on the blog and on social media. Anyhoo, where was I? Oh yes, the anticipation of where the shawl direction was going to go. Needless to say...I was disappointed when the last two clues were released. I had expected...more. To the clues, to the overall design of the shawl. I know, I know, it's a mystery knit-along and you signed up for the surprise and nowhere does it state that the design had to be out of this world extraordinary, but in my experience MKALs are usually interesting and is a time when the designer experiments, tries something new or plays with stitches and/or techniques. I feel like I didn't get that. As I've mentioned before, I absolutely love the colours I chose and really like how the fade was turning out, but I most likely wouldn't wear the shawl. Maybe once or twice, but that's it. My shawl, even without clue five and only halfway through clue four, was already massive. I contemplated stopping where I was in the pattern and just binding off, or maybe frogging back a bit and not have so much garter but then the shawl wouldn't have the fading colours - which is the main point of the whole shawl. Overall, the shape of the shawl, a traditional triangle shawl, just isn't my cup of tea. Triangle shawls are generally too long in length and shorter in wingspan, and I feel like my short frame would be overwhelmed in such a large shawl. I immediately think of that Lenny Kravitz wearing a blanket as a scarf meme, cause that's how I imagine I would look if I were to wear this massive shawl if it were knit to the very end. Aside from the immense size of the shawl, I also couldn't justify the total cost of the yarn used for a shawl I was never going to wear. If I had used commonly found yarn that you can get at any craft store (like Lion Brand) or a yarn shop staple (like Berroco) or even Knit Picks (which is readily available to me at a very good shipping price as I'm located in North America, not so convenient or affordable in terms of shipping if you live overseas), then I would normally finish the project and then gift it. Yeah, not this time. I had to wait for a shop update, took advantage of a free shipping opportunity, and spent hours online trying to find a Canadian supplier in Canadian currency to find all the indie-dyed yarn that I had used. As much as I hate wasting knitting time, I don't mind frogging the whole project if it means being able to use the yarn for something I will wear. I'm thinking of either a So Faded pullover or a Find Your Fade shawl (both by the same designer as The What The Fade?! ), or maybe a Sprouting Brioche shawl (the shaping and use of increases is stunning!). I won't be casting on anything any time soon though, I made myself promise that I would get at least two or three WIPs off the needles AND I have some priority knitting to do first. Maybe one day I will return to this pattern and knit it again. I think it would look lovely in a long gradient (and less ends!!) with either a reverse of the gradient or a contrasting yarn for the brioche part. But for now, I'll just admire the shawls that other MKALers finished and take notes on the fades and the colours used. Ok fine, I'm making a list of yarns I want. After all, while this design was a miss for me, there are a few that involves fading from the same designer that are a hit for me. Anyone else frog their shawl or any other mystery knit-along? What did you end up using the yarn for? I agree, MKALs are starting to involve more yarn than ever. And in several colours. I don't know how many designers keep in mind that not everyone has access to indie dyers (or are willing to dish out an arm and a leg in shipping costs alone! ), or is being given yarn support from an indie dyer to knit their designs. I thought I had learned my lesson from the last MKAL I participated in, I guess I had high hopes for this one? I did have plans to join 2 other MKALS that are currently happening, I decided to opt out last second! I started Ysolda's Follow Your Arrow MKAL and ended up frogging after the second clue. I just couldn't see myself wearing the finished shawl (the shape was already getting unusual, and I wasn't convinced I'd love it). I ended up using the yarn to knit Flukra, which had been in my queue for ages and I love the finished shawl! I really enjoyed following the MKAL knits of the other participants, but I learned pretty fast that unless I can see the finished item, I'm not prepared to commit. My knitting time is fairly limited, and while I love to knit (obviously! ), I want to spend that time knitting something I can at least be pretty sure I'll love. I have to admit, when I did the Follow Your Arrow MKAL, I waited until each clue came out and saw spoilers of what that clue looked like before continuing on. I did mine in 1 colour and actually really liked the end knit. I just don't think I would have worn it though, and ended up gifting it to a person who really appreciated it and wears it regularly. I think I've finally learned my lesson though as I decided to hold back on the other 2 MKALs I was thinking of joining! I've only ever done one MKAL, and it only took two skeins of yarn, and I really lucked out with the finished project. Most of the time I will not knit anything if I can't see what the finished project will be, I need to know that I will use and love (or enjoy knitting and gift) whatever I make. 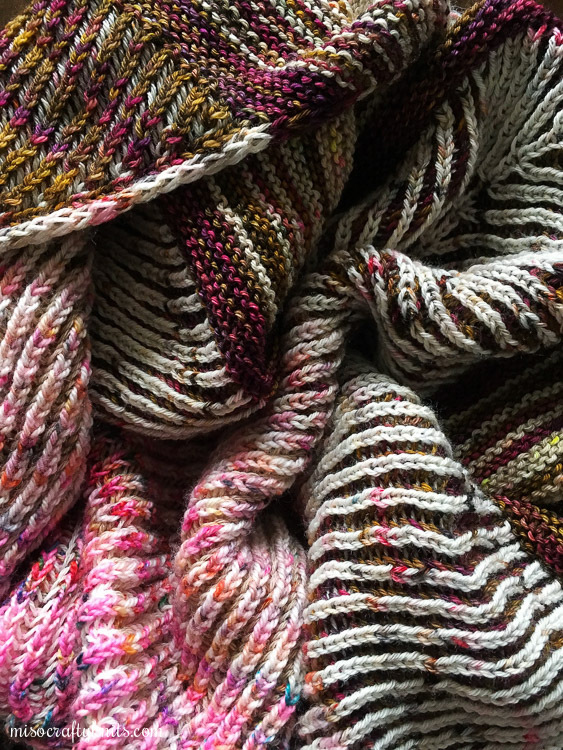 Lucky that you ended up liking your finished MKAL knit!! I think I'd be fine if it was a 1 or 2 skein MKAL, but when it involves way more yarn like this one did, I think I will sit back and wait until the hoopla is over to see if it's worth my time. I'm just glad that I did enjoy the knitting in this MKAL, so I don't feel like I've wasted too much of my time (since I have quite a few FOs that have yet to have their ends woven in and be blocked - I just like the act of knitting!). Thanks for being so thoughtful about this. I've been burned by a few MKALs over the past few years and it's turned me off to the whole thing. The cost of the yarn and the time investment....now I wait until the MKAL is done and then decide if it's really a project for me. Onward and upward! 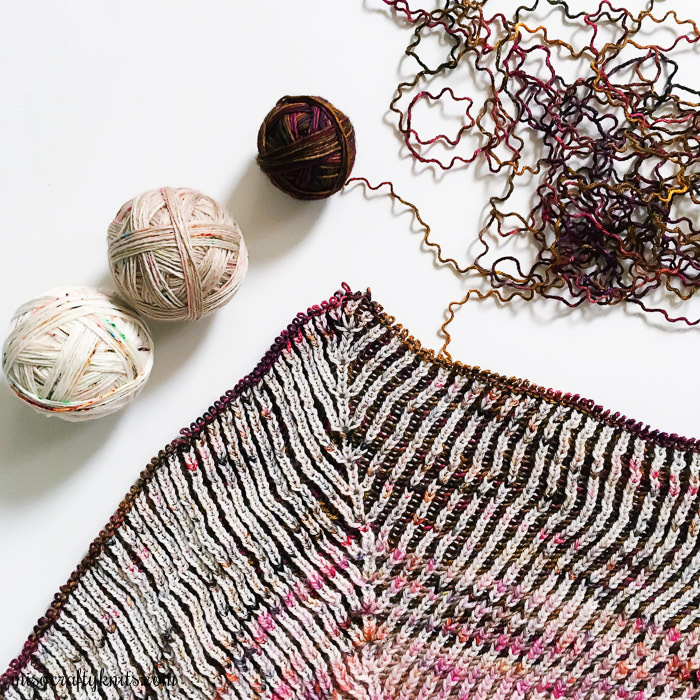 Before writing this post, I've heard a lot of knitters talk about how they don't do MKALs more so because they need to see the finished product before making the commitment. It wasn't until after this post that I'm starting to learn just how many people have been burned but not just one but several MKALs in the past. And that's a huge reason why they no longer do MKALs. I feel so much better knowing others share my thoughts and feelings about this particular MKAL and feel like I've helped at least one person not feel like a failure for not completing the project! Yeah, I've sworn off mystery KALs after getting burned a few too many times with projects that I ended up either giving away or frogging. I feel your pain! However, loving the So Faded I am knitting right now, and the Comfort Fade is probably next on my list! Yes, I've decided no more MKALs for me!! I haven't bought the pattern as I wanted to see what it was going to be and I'm glad. I thought the finished shawl was underwhelming although the overall effect was pretty, I just don't think it was worth all of the hype. I only do mkals from 1 designer as I like everything she does pretty much. Thank you for your honest blogging.